Stoneware Pottery by Hil-Dee Bates: Small Wavy bowl in mouthwatering shades of mint, green, cream and raspberry. Wheel thrown then hand sculpted into a lovely scalloped bowl. 3 1/2" high x 8" in diameter. Hil-Dee's pottery is functional. 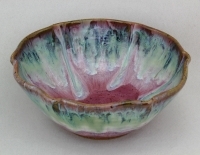 Glazes used are lead free and food safe. Can be used in the oven and microwave. Dishwasher safe.